If you have looked under the 'Pies & Tarts' section of the website you know that I have a fondness for tarts, especially fruit tarts. This recipe is for a free form Berry Tart which is especially nice as it has a crisp and crumbly pastry base and the filling is made with a medley of lightly sweetened berries. Wonderful with scoop of vanilla ice cream or a dollop of softly whipped cream. The pastry I like to use for this Berry Tart is Pate Brisee (short crust pastry), which has a wonderful buttery flavor and crumbly texture. It is easily made in the food processor. Just remember that the butter and the water need to be very cold. Once made, the pastry must be chilled until firm before rolling into a large circle. The tricky part is rolling out the pastry. In order for it to roll out smoothly, without it sticking to the counter or tearing, it has to be at the right temperature. Too cold (it will tear), too warm (it will stick). This "feel" for the dough will come with practice, so don't get discouraged if you have some trouble at first. If the rolled out pastry tears a little, don't worry, just patch it back together as best as you can. For the berries, use whatever is in season. Good choices are raspberries, blackberries, blueberries, and/or strawberries. The berries need to be sweetened, so taste your berries, as you can adjust the amount of sugar used. I also like to add a little cornstarch to thicken the berry juices. 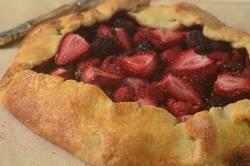 Once you place the berries on the pastry, leave a border because the pastry is folded up and over the filling. Make sure that the folds of pastry are sealed so that the pastry does not fall open during baking. The tart is baked in a hot oven until the crust has nicely browned and the fruit's juices just start to bubble. Pastry Crust: In a food processor, place the flour, salt, and sugar and process until combined. Add the butter and process until the mixture resembles coarse meal (about 15 seconds). Add about 3 tablespoons of water and process until the dough just holds together when pinched. Add more water if needed. While the pastry is chilling, line a baking sheet with parchment paper. Once the pastry has chilled sufficiently, remove from the refrigerator and, on a lightly floured surface, roll the pastry into a 13 inch (33 cm) circle. Place the pastry circle onto your baking sheet and cover with plastic wrap. Place in the refrigerator to chill the pastry while you make the filling and preheat your oven. Preheat your oven to 400 degrees F (200 degrees C) and place rack in center of oven. Filling: In a large bowl, combine the berries, sugar, and cornstarch. Remove the pastry from the refrigerator and arrange the berries on the pastry, leaving about a two inch (5 cm) wide border. Scrape any remaining sugar from the bowl and drizzle over top of the berries. Gently fold the edges of the pastry up and over the berries, pleating as necessary. Make sure to seal any cracks in the pastry. Bake for approximately 30 - 35 minutes or until the crust is golden brown and the juices are just starting to bubble and start to run out from the center of the tart. Remove from oven and place on a wire rack to cool before serving. Serve with softly whipped cream or vanilla ice cream. Cover and refrigerate any leftovers.